What next for Everton and Sam Allardyce under Farhad Moshiri? Everton owner Farhad Moshiri has marked the second anniversary of becoming the club's major shareholder - and while the billionaire has changed the landscape at Goodison Park, any celebrations will have been muted. The 62-year-old British-Iranian businessman has brought ambition and high finance to Everton after years of making ends meet but a season that opened with optimism after the club's biggest spending spree is drawing to a stale conclusion against a backdrop of disappointment and uncertainty. Moshiri's appointment of former England manager Sam Allardyce on an 18-month contract, after a five-week search for sacked Ronald Koeman's successor, has failed to clear the air over Goodison Park and more changes may yet be contemplated in the summer. So how can Moshiri's two years at Everton be viewed - and what direction will he take next? When chairman Bill Kenwright, after a search stretching back a decade, struck an agreement for Moshiri to buy a 49.9% share in Everton he called him the "perfect partner" to take the club forward. In most fans' eyes, this meant an owner willing to put hands in deep pockets, unlock Everton's full potential with huge transfer budgets and finally deliver on the promise of a new stadium after previous plans floundered. Moshiri can say, with justification, he is fulfilling those criteria. Everton have spent £277m on players since his arrival - we will return to how this money has been spent later - and brought the prospect of a move away from Goodison Park closer. Former Everton midfielder Kevin Kilbane told BBC Sport: "There have been a lot of false dawns at Everton, thinking there might be serious investment and it hasn't quite happened. At the back of my mind I was wondering whether he was really going to throw money at it but he has put his money where his mouth is. "He has helped the club in a progressive way and no-one could ever accuse him of not providing the finance." Everton's accounts, released in December, revealed Moshiri has pumped £150m into the club via a loan with no fixed repayment date. This money funded investment on players, wiped out a £28.5m debt while reducing annual interest charges and improved Goodison Park and the Finch Farm training base. Moshiri has also overseen spending of £9.1m on securing a prestigious site for Everton's new stadium at Bramley Moore Dock on the waterfront and initial planning. He has brought tangible progress by putting deals and the money in place to bring the move towards fruition. There will always be an understandable element of "we'll believe it when we're sitting in it" among Everton's fans but there is now genuine belief it will happen. Everton have engaged supporters on the project with a 51-question survey to help shape development of the stadium, with world-renowned stadium architect Dan Meis ready to deliver designs. They have agreed a 200-year lease on the land at Bramley Moore Dock to gain control of the site and the stadium will be funded with the help of a £280m loan from Liverpool City Council. The estimated cost is now £500m with a projected opening date at the start of the 2022-23 season. Moshiri's wealth is underpinning the project - it would not even be under consideration without it - so while he can, and will, be scrutinised heavily in other areas, he has fulfilled his part of the bargain here. The theory that a rich backer would cure Everton's ills has been proved spectacularly wrong. Everton spent £150m last summer, the fifth highest in Europe. It has been exposed as an ill-conceived, scattergun exercise which even ended up failing to replace £90m top scorer Romelu Lukaku after his move to Manchester United. Here, Kilbane has sympathy for Moshiri and also, to an extent, for Everton's recruitment team. Kilbane says: "He has put a lot of trust in the director of football Steve Walsh and his recruitment team. Recruitment is still the biggest thing but it is perilous. You don't know how it's going to go. "You may see someone who is a superstar at another club but then they walk into somewhere like Everton and it just doesn't go the way it is expected to. With the majority of Everton's signings there are only one or two you maybe think have been done well. Others just haven't worked out. "I don't think you can question Farhad Moshiri because he has put his hand in his pocket. He can ask questions of other people at the club as to why they are not producing what they thought they were going to get. And he is quite within his rights to ask those questions." And yet it started with relative success. Moshiri's first big decision was to sack manager Roberto Martinez three months after taking his major shareholding. It was a move that was inevitable, taken as the first sign of the new Everton era. He was sold on the idea of a superstar in the dug-out and a director of football pulling the strings behind the scenes. Koeman, lured from Southampton by the sheer weight of Moshiri's financial promises on and off the field, fulfilled the first criteria while Walsh, lauded for signing the likes of N'Golo Kante, Jamie Vardy and Riyad Mahrez as part of Leicester City's 2016 title-winning set-up, was his other half. Despite finishing seventh last season and returning to Europe, it looked like an uneasy arranged marriage. The transfer strategy lacked coherence to such an extent that Koeman was sacked in October with Everton in the relegation zone barely weeks after the most lavish outlay in the club's history. The Europa League campaign was an embarrassing failure. And then came a hunt for Koeman's successor that descended into acrimony when Moshiri failed to prise Marco Silva from Watford. Everton eventually received a legal "cease and desist" letter from Vicarage Road demanding they back off, despite a willingness to pay £15m in compensation. After the farce came panic, or at least an element of it, when Allardyce's name reappeared even though he had previously dropped out of contention because of lack of serious interest from Everton. He was out of the picture until an embarrassing 4-1 loss at Southampton persuaded Moshiri that caretaker David Unsworth was not the answer and action needed to be taken. Allardyce was in five weeks after Koeman's dismissal - but his position is already being questioned only three months later. Moshiri poised for another summer shake-up? Allardyce was unquestionably Moshiri's appointment - others with influence around Everton might have preferred keeping Unsworth until the end of the season - so its success (or otherwise) will land on his desk. Kenwright remains chairman but his shareholding is now only 12.16% so his power in the decision-making process is diluted. There was an early bounce under the 63-year-old, winning four of his first seven games - but since then it has been a mixed bag. Although Everton are ninth in the Premier League, they have lost their past four away games. The 5-0 defeat at Arsenal and the dismal loss at Watford saw Allardyce place blame squarely at the feet of his players in a "it's not me, it's them" ploy, while supporter apathy - and in some quarters discontent - has grown about his methods. He took responsibility after the 4-0 loss against Tottenham at Wembley, but cemented misgivings about his style when he said about his team selection: "I should have got back to being a bit more boring and a bit less adventurous." And with the shield of Koeman removed, Walsh, who arrived with a reputation as a transfer market master, finds his position under scrutiny inside and outside Goodison Park. PSV Eindhoven sporting director Marcel Brands has been linked with a role at Everton. Everton have signed 18 players on his watch. Few can be regarded as unqualified successes. Goalkeeper Jordan Pickford falls into the category, although hardly an unearthed diamond at £30m, while Wayne Rooney has had his moments. Record £45m buy Gylfi Sigurdsson and Theo Walcott, at £20m from Arsenal in the January window, have also shown what they can offer. Idrissa Gueye, bought from Aston Villa in summer 2016, can be credited to Walsh while Ademola Lookman, at £11m from Charlton Athletic, looked rich in promise but barely got a chance before going on loan to RB Leipzig in Germany. Davy Klaassen, signed for £24m from Ajax, is an unused outcast - although that deal was clearly a Koeman production. Sandro Ramirez, a £5.2m summer signing from Malaga, is back on loan in Spain at Sevilla. Latterly, and significantly, Everton spent £27m on striker Cenk Tosun from Besiktas to give Allardyce the first signing he regarded as an important signal of his intent. The Turk was dropped after two starts and effectively declared unfit for Premier League purpose at that point by Allardyce with Oumar Niasse, a figure of mockery early in his Everton career, preferred. Against this background, it would be a brave call to suggest with 100% certainty that Allardyce and Walsh will see the start of next season. In Allardyce's defence, he is the third manager this season to have been embarrassed by Everton's players in certain games - and he should keep them away from relegation. Everton's problems cannot be solely laid at his door. The squad he inherited, with three "numbers 10s" signed in the summer in Klaassen, Rooney and Sigurdsson, was so unbalanced it could barely stand up straight. Allardyce, however, is encountering a familiar problem in that Everton's supporters have not warmed to, or formed any bond with, one of the game's more divisive characters. Former striker Kevin Campbell tweeted after the Watford loss: "Everton need a manager who will set the club up for years to come. Must be young enough, brave enough and ruthless enough to progressively steer the club forward." And in his weekly Liverpool Echo column, former defender Michael Ball wrote: "I know Sam came into the club to do a job but do we want to see this kind of football next season? I know I don't. "Will he change his ways next season to take us to that next level? I'm very doubtful Sam will do so." 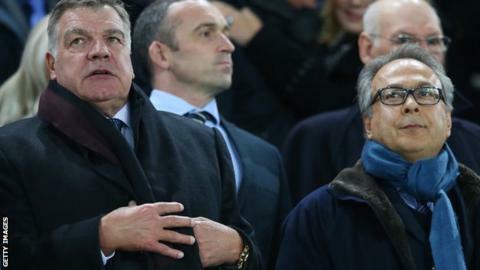 Allardyce has lost five and won five of his 14 league games at Everton, a win rate of 35.71% that edges up to 40% if you include, as he has done, the 4-0 victory against West Ham United when he watched from the stand but the team was actually under Unsworth's charge. Would Shakhtar Donetsk's coach Paulo Fonseca be a better fit for the Goodison faithful? There are also other factors at work. Silva, Moshiri's first choice to succeed Koeman, is available after being sacked by Watford following the collapse of results in the wake of Everton's interest. Shakhtar Donetsk's coach Paulo Fonseca was considered to succeed Koeman. He is out of contract at the end of the season with his reputation enhanced by impressive work in the Champions League. Kilbane is also uncertain about Allardyce's future. He told BBC Sport: "I think it is very much in the balance. Four or five weeks ago I suppose it was a different answer I was giving you. "Given that he only signed an 18-month contract, you almost see it as a stop-gap, someone who can come in, stabilise the club and then they can rebuild going forward. "I think it is quite feasible to suggest Sam Allardyce probably won't be managing the team next season." Everton's lack of progress on the field and the failure of his first phase of vast transfer expenditure means Moshiri, at this stage, has had a paltry return on his investment. However, he still retains much goodwill among Everton's fans because of his obvious ambition, financial support and his determination to drive through the new stadium. Kilbane says: "He's done a good job bringing the club forward. The new stadium looks like it's on the horizon, he has ploughed a lot of money into the club. Everything around the place has improved when you look at the infrastructure. There is modernisation of the training ground. "Lots of progression is being made but ultimately the club hasn't progressed on the pitch in relation to the Premier League standings, which is where you are ultimately judged." Moshiri said in a rare interview recently: "You get bumps in the road but the plan we have is intact and we will go through that plan resolutely to achieve what we want." The next phase and decisions to be made over the next few weeks will arguably be his most crucial.